Little Foot turned 20 weeks old yesterday… and today, we realised that as days turned to weeks and weeks turned to months, she had slowly but surely outgrown colic. Today, we were pleasantly surprised when realised that she didn’t have a bloated tummy anymore. Nothing brings more joy than knowing that the worst is over. Over the last couple of weeks, I also noticed that her appetite had increased, and suddenly, we were digging into the modest frozen milk stash we had to make sure she had enough to drink. All the signs are showing that our days of breastfeeding are numbered. Little Foot was only a fully breastfed baby from 2 month old, after we figured out that formula milk was adding to her tummy woes. Thankfully, somehow, there was just enough to feed her on a normal day, and on her milk strike days, we stored the excess. To Little Foot, I can only say, it was love that gave me enough determination to keep pumping, latching, trying until there was enough milk. It was love that made me wake up in the middle of the night walking like a zombie to the living room to pump while the world and my baby slept soundly. What a long way we had come. At 1 week old, she pushed me away and opted for milk bottles. 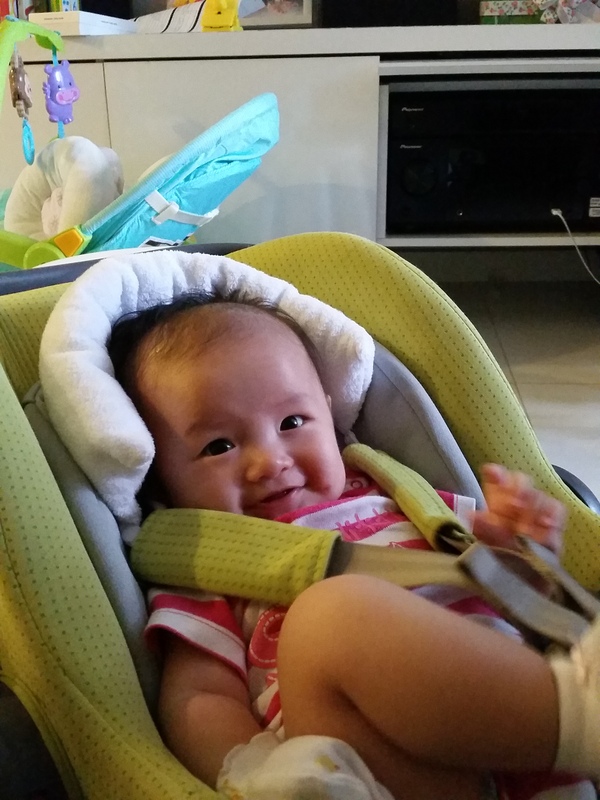 Miraculously, at 6 weeks old she pushed away the milk bottle for the first time and wanted to latch again at the nursing room at the Baby fair in Suntec. 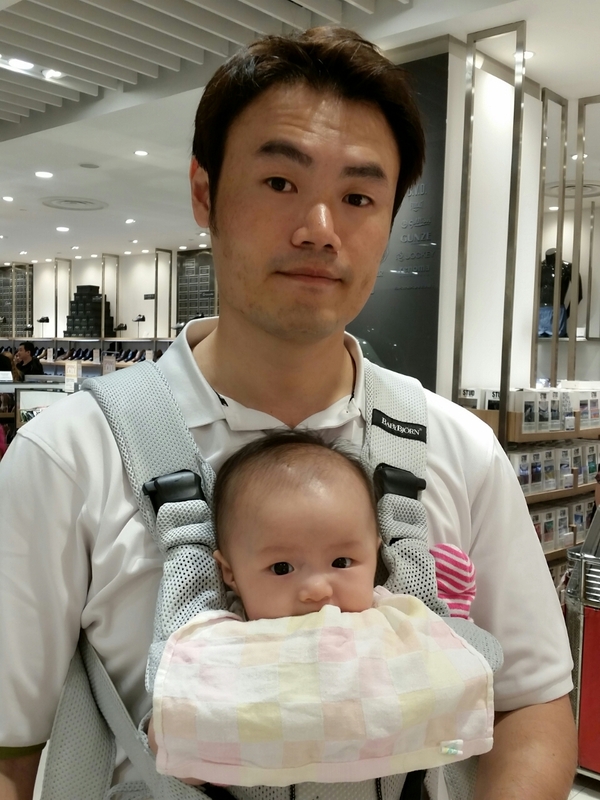 By 2 months old – she refused her milk bottles. 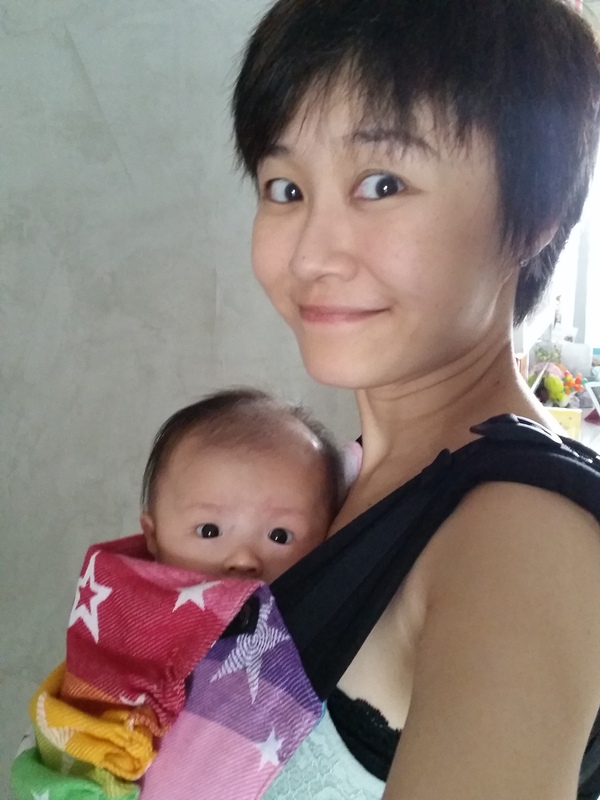 It was her way of telling me “Mummy, hold me tight and I’ll be fine” while the colic raged. I took on the challenge, and like my older sister said, how ironic things could be. Everyone expected me to be the cool mama who would be happy to just do “enough” and then give formula milk. Who would have known we would be in this situation that milk powder was a no no? In the four months, I’ve seen two ends of the spectrum – mummies with too much milk (and some still unsatisfied and keep listening out for and loading up on foods that could bring up supply), and mummies like me, who have too little milk, with some stopping as early as the first couple of weeks. To both ends of the spectrum, I can only say, time will equalise everything. Certainly, there will be a time when the milk runs dry, and we are no longer judged by whether we are breastfeeding mums or not. Then, we will be judged on other things – time and effort spent on our child – not judged by something that is decided mostly by nature. As my breastfeeding journey is nearing an end, I can safely say I have done my best, and done what I can. I may not have been a milk fountain, and my baby may not look like a Michelin tyre mascot, but I have done my best. And it has been a wonderful time of bonding. In a way, I’m thankful that I can stop the constant worry over the last two months that we might run out of milk (and then what can she drink???). I’m also getting pretty excited as we now start preparations in anticipation of weaning and starting Little Foot on solid food (read: bought many things). The day of returning to beer, coffee and spicy food is near. Yay! To all mummies and mummies to be, whether it was 1 drop, 1 day, 1 week, or a Kallang river of milk, whatever we can give, we have given. Don’t feel bad about peer pressure, and definitely don’t feel pressured to the point of eating any damn thing that is touted as a milk booster. Quality over quantity. That’s what I will continue to advise anyone who asks. I learnt it the hard way when I took Fenugreek and only realised weeks later that it was one of the culprits that made Little Foot’s stomachache worse (if not the root cause). To drive the point home – my mother never breastfed me, but that had never hindered my connection and relationship with her. Life is more than just milk. Anyway, by 18 months when they are of playgroup age, we won’t be comparing milk anymore, but what sort of “enrichment” classes our bubs are signed up for, and milk will be just a distant memory. 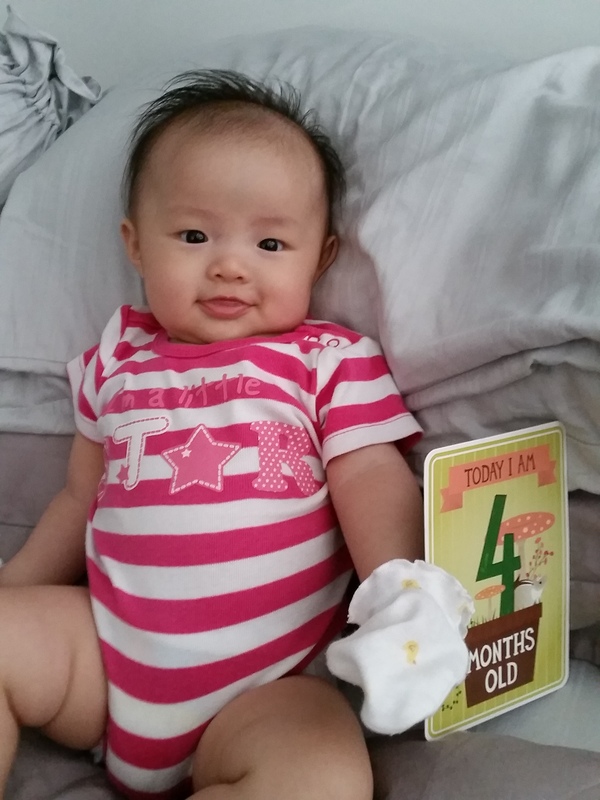 Our precious Little Foot has reached her fourth month milestone. 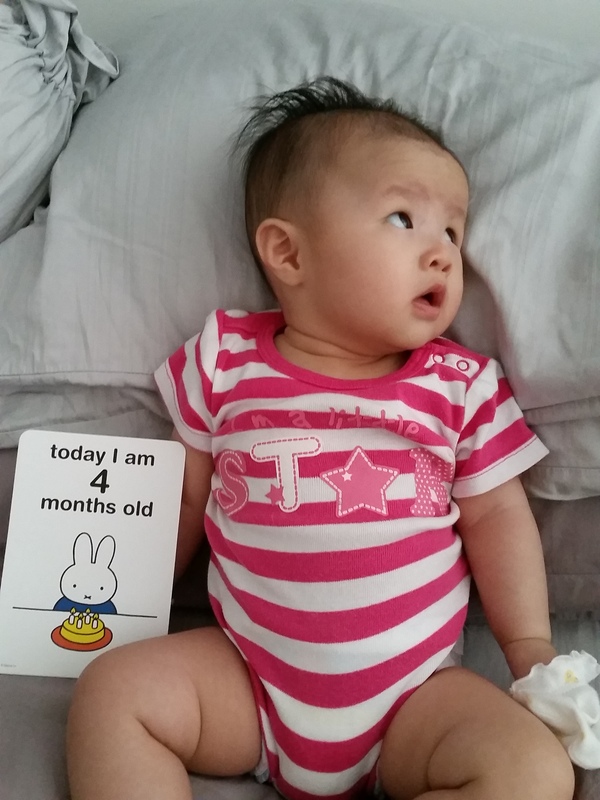 For some, the 4-month milestone is marked by biscuit necklaces, drumstick tasting and some other traditional rituals. Since both sets of grandparents said there was no need to do these, but only said to get her shaved, it is a quiet day. A day that started out with an overflowing diaper, and then filled with a sweaty baby that refuses to take her naps or have a good full drink of milk. The usual routine more or less. 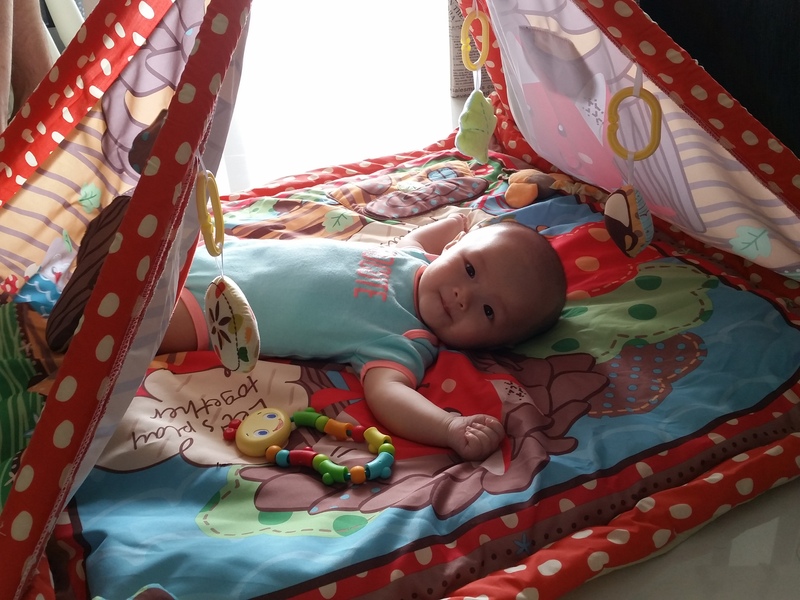 It leaves me with some time to think of how she has grown, and all the little and big milestones we have had since we first met the night of 6 Dec 2014. (As I write this, I’m listening to SNSD’s “Dear Mom” and about to choke on the sourish feeling in my throat). My baby is much more smiley these days. I say “Yeeeeaaaah!” and she would grin back (most of the time). She’s starting to plaster more to me these days. Her intense eyes, unblinking, would follow my movement around the room, as if afraid that I would leave her, even for awhile. She still has her frequent grumpy moments, especially on bloated tummy days. She’s still difficult to put to sleep. 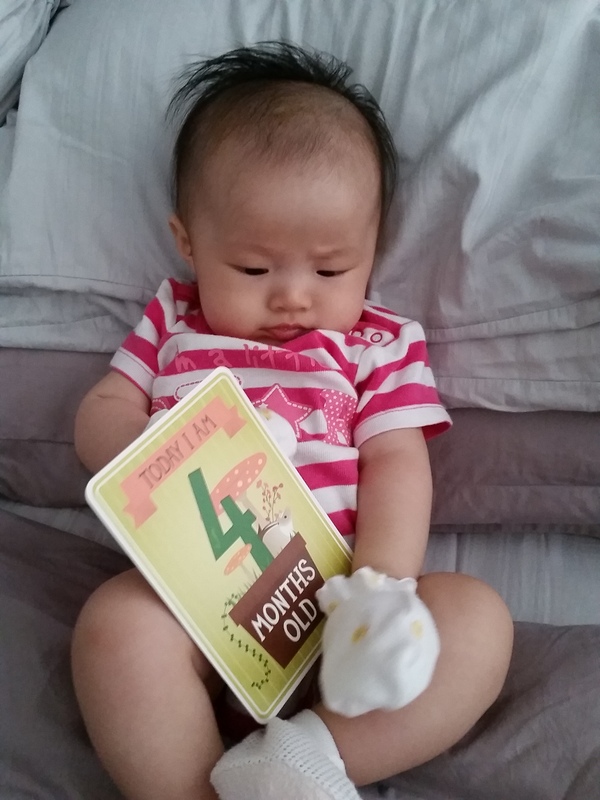 And few days ago, we spotted the first signs of a tooth peeking out… sighh, moving on to more milestones. I love every part of her, her QQ cheeks, her baby hands and baby feet, the small dimple she has when she smiles, those intense eyes that would enlarge as much as she can to look and stare, the knitted brows when she frown, the baby smell she still carries with her, the softness of her scanty baby hair which I had refused to shave when she was one month old. Even the way she cries… like a sputtering engine before launching into a full volume cry, her horse kicks and “taxi flagging” arm motions. I could go on and on. We have received so much compliments about her cuteness, that I’m starting to feel a little “yaya papaya” these days. Strangers would walk past and remark “So cute!”. 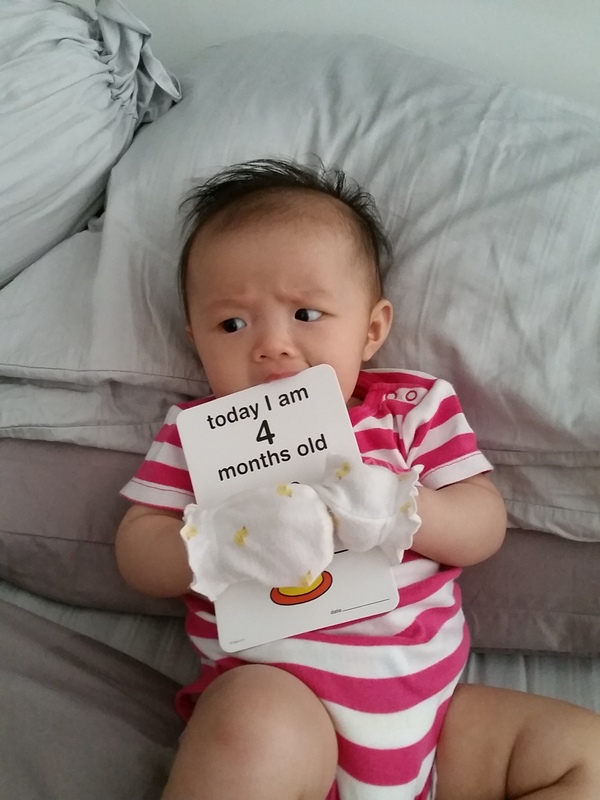 Four month old is a ripe young age yes. We’re not in a hurry for her to grow up. Her babyness is really like sand that is slipping through my fingers, but I’m overjoyed whenever she reaches a new milestone. So to mark this special day, I cut a little lock of her hair, for my keepsake (adding on to the evergrowing amount of her baby things that I am hoarding). Still deliberating if we should shave her. I probably will have to, but maybe just drag a few more days. 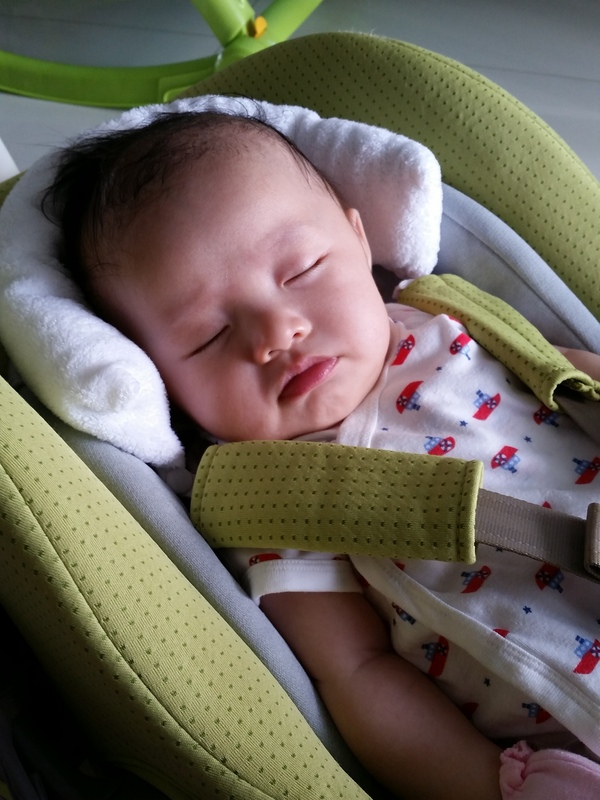 Let me enjoy her sweaty hair for a few more days… the soft touch of her first hairs in my hand when I sayang her to sleep while she latches… all these I will miss. Maybe I could drag on forever. Hah! 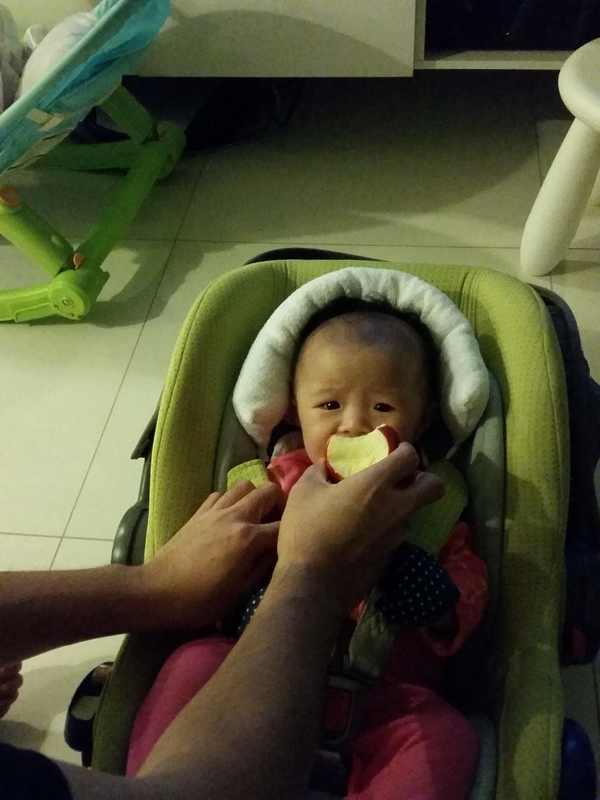 Her Daddy’s idea of a celebration – letting Little Foot try his apple. Her first contact with real food. The cogs of the clock will keep turning and turning. Inevitably, we have to stop trying to hold on to the present as it becomes the past, that is when we will be able to enjoy the present that will be the future. For now, I stare at the little lock of hair, and I feel tears welling up in me, tears of joy and sorrow all at the same time. Parenthood is really filled with many many of these dilemmas. You want them to grow up, yet you don’t want them to grow up. I desperately just want to hold on to all the memories. And perhaps I understand why going senile at old age would be one of the most painful things to encounter, because that would mean losing the past, all the precious memories that we take a lifetime to store.